As I embarked on the T3 project, a couple of doubts that had been lurking in the back of my mind started to make themselves known. First, I wasn't sure that I knew how to run a steam locomotive. Of course I had read lots of books and articles about it, although most of them were more concerned with building than running it, but that is not the same thing as having a boiler full of steam and a clear road. I knew the regulator was supposed to make it go, the reverser would select the direction, the boiler should be kept topped up, gas firing meant no shovelling or a blower to worry about, but somehow there must be more to it than that? The other issue was time. I'm not the fastest worker and if you have been following the story so far you know that I will compromise, but not very much. 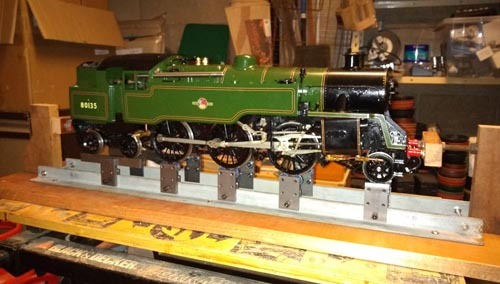 Whichever way you look at it, this loco is going to take years to finish, and what was I going to do in the mean time? The solution to both problems was a ready to run Kingscale 4MT. Cliff Barker was offering them at a very favourable price. 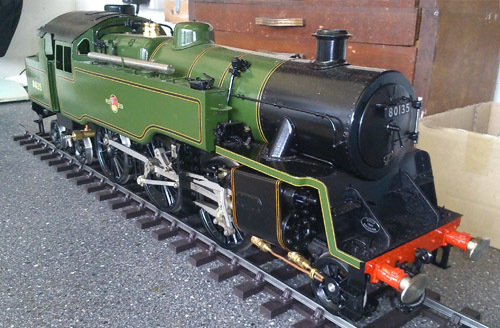 I like the 4MT, it is a handsome loco. There was a choice of black and green liveries. 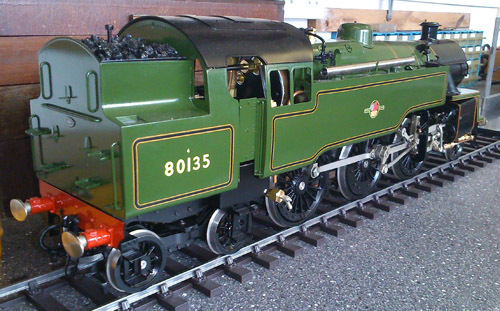 I chose green which is the preservation livery (BR was black), on the basis that I had a model of a preserved loco and could realistically run almost anything behind it. Not that anyone really cared, Gauge 3 is refreshingly free from such pedants. So, the theory was that I could learn to drive this loco, and it would keep me entertained at Society garden get-togethers while the construction of the T3 proceeded. There was just one problem - it wouldn't go. I followed Cliff's instructions very carefully, but I could not get it started. In the spring and summer I took it to several get-togethers and met people who were very patient and helpful, and shared their expertise with me, but to no avail. It still locked up under steam pressure and would not start. It was frustrating and I began to have doubts about the whole live steam project. Finally Cliff came to my rescue and discovered that it definitely would not start in full gear, but by backing off the reverser several turns (it is a screw reverser), it was finally persuaded to make several circuits. I went home that day much happier. Our conclusion is that the valve timing is most likely wrong and full gear allows steam on the wrong side of the piston. I have not stripped it down to investigate further, certainly not until I have had more experience of running it. There were a few other, more cosmetic, issues. 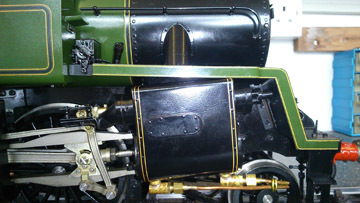 The front footplate was misaligned with the tank on one side and needed very careful bending back. On one side the rear steps prevent the buffer retracting. 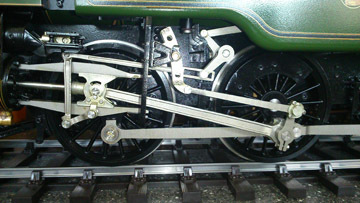 The valve gear is rather obviously assembled with screws and it shows. Some of it was clearly the desire to keep cost down, but the assembly of the model could have been considerably better. Cliff told me that it would need a lot more running in until it was properly free. By then we were at the end of the 2018 season, which left the question of what to do over the winter? I decided to build a rolling road. This was a diversion from the T3, but much quicker than building a garden railway. I consoled myself with the thought that it would probably come in useful for the T3 as well when it reached that stage. I found a couple of lengths of suitable angle in the scrap pile, ordered up a bag of ball bearings, and before very long was able to start running in the garage. 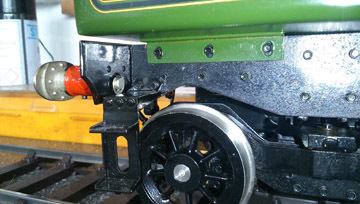 At present the driving wheels still need a push to start, but the loco is gradually running itself in. Of course it's not as much fun as running on a real track, and I'm looking forward to the 2019 season. I'm very grateful to the people who organise get-togethers and to the Gauge 3 Society members who have shared their expertise and time so willingly to help me (and the loco) to get going.